April was born on Haida Gwaii (commonly called the Queen Charlotte Islands), off the north west coast of Canada's British Columbia, just a short boat trip from Alaska. 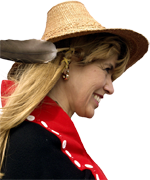 The First Nations people are known by their original name, the Haida. More talented artists have originated from this small group of islands than anywhere else in Canada. Here art isn't a past time, it's a life time. In 1792, Captain George Vancouver reported seeing many giant wooden human statues. That same year French expedition leader, Etienne Marchand, marveled at the "paintings everywhere, everywhere sculpture, among a nation of hunters." He said: "every man is a painter or a sculptor." April has dozens of relatives living in these islands, all practicing indigenous art--painting, sculpting, totem poles, carving masks using cedar bark and spruce root in weaving, jewelry making, steaming bentwood boxes and creating art out of the stone unique to the islands, Argillite. Early in her career, she honed her painting skill and refined her abilities while practicing geology, having graduated from the University of British Columbia. When you think about it, being a geologist in the vast remoteness of Canada's West is good experience for any artist. Combine this wilderness experience with a heritage rich in Native Americans' culture, art, sculpture and music and through her father, a direct descendant of the world-renowned Haida artist, Charles Edenshaw, of the Eagle Clan. She is also a relative of the late Bill Reid, the equally famous contemporary Haida sculptor, carver, printmaker and jewelry designer. 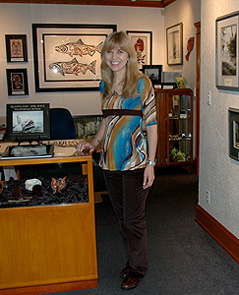 She gives definition to Native American north west coast art as she captures its landscapes and its indigenous peoples. April realized, after a few years in the bush as a geologist, that she was inexplicably possessed by painting---particularly watercolours, for their portability. After graduation, she finally had time to realize that she had always been drawn to it. It took a while until April fully recognized how strong its pull might be. In the eighties, she made the decision to put down her rock pick and hand lens, and pick up her paint brushes for good. Since then her career has taken her all over North America, particularly to the globally famous juried shows and Indian Markets in Santa Fe, Portland, Scottsdale and Phoenix. She is one of only half a dozen or so Canadian artists who show their works and compete for awards at these most prestigious shows and festivals. Almost every year she has entered and won awards. Her reputation follows her back to one of three places on the north west coast. In Powell River, on the Sunshine Coast north of Vancouver, she owns a beautifully restored (1928) building on historic Marine Avenue. Here she houses all three of her businesses: Wind Spirit Art & Gallery, Wind Spirit Printmakers where she pulls her own prints, and the custom frame shop. "When people come into the gallery in Powell River, many say they can't believe that only one person created all the art," April notes. "That took me back a bit at first. It seems quite natural to me. But now I realize that their initial surprise is due to the diversity of the art. There is a vast difference between a traditional Haida formline graphic and a wet-on-wet, loose watercolor." 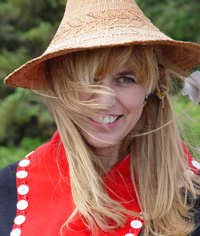 When she needs to 'come home' for inspiration and rejuvenation, she has another home in Massett on Haida Gwaii. Perched on the northern tip of these rugged but beautiful islands, April says "in Masset I am really able to re-infuse myself with the power that comes from my Haida culture. When I'm creating art, I experience innate memories that deeply connect me to my cultural past. It's as if not my eyes, but only my brain is really doing the seeing. The feeling of this cerebral vision is supernatural...magical." Creating art is everything for April---her life and inspiration. Take time and enjoy your visit with April and her art. Words can't begin to describe her work. Just a glimpse of what she imagines, and the myths and legends of her people, live forever in her art.